Huge Savings Item! 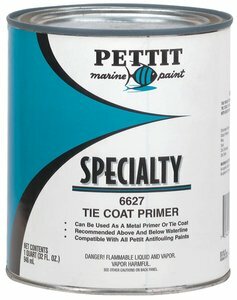 Save 16% on the Tie Coat Primer 6627, Quart - Pettit Paint by Pettit Paint at Beaver County Collision. MPN: 6627Q. Hurry! Limited time offer. Offer valid only while supplies last. This is a general purpose chlorinated rubber type product used as a primer on metal surfaces and as a tie coat between different types of coatings. This is a general purpose chlorinated rubber type product used as a primer on metal surfaces and as a tie coat between different types of coatings. This versatile product can be used successfully above and below the waterline as a primer and over a variety of coatings as a tie coat. It is compatible with all antifouling bottom paints and all types of topside finishes. Available in quarts and gallons. If you have any questions about this product by Pettit Paint, contact us by completing and submitting the form below. If you are looking for a specif part number, please include it with your message.